For a limited time only, we are offering FREE grease with the purchase of this gear 2 Pack! This is a savings of $4.98! You need to act quickly as this offer is only good for a limited time. No need to add the grease to the cart. We will ship it with your order. Sears Craftsman Garage Door Opener Replacement White Main Gear 81B0045 2 Pack. Drive Gear Bore Size: 1/2"
Drive Gear Outside Diameter: 2 3/4"
Sears Craftsman Liftmaster heavy duty after market main drive gear replacement part 81B0045-WG/ 41A2817-WG is for all Sears Craftsman, Liftmaster, Chamberlain Group chain and belt drive openers manufactured from 1984 to present. If you don't need the sprocket assembly, this is the most economical way to "refurbish" your garage door opener as this is the most common wear part in the opener drive system. 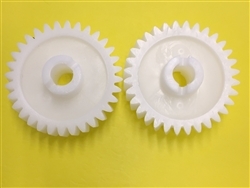 This gear is the direct replacement part for the following garage door openers: Lift-Master, Sears Craftsman, Chamberlain, Master Mechanic and Garage Master. This is just one of many of our Sears Craftsman Liftmaster garage door parts that we have in stock and ready to ship. For a complete selection of Sears Craftsman Liftmaster garage door replacement parts, please select the Liftmaster or Sears Craftsman category at the left. 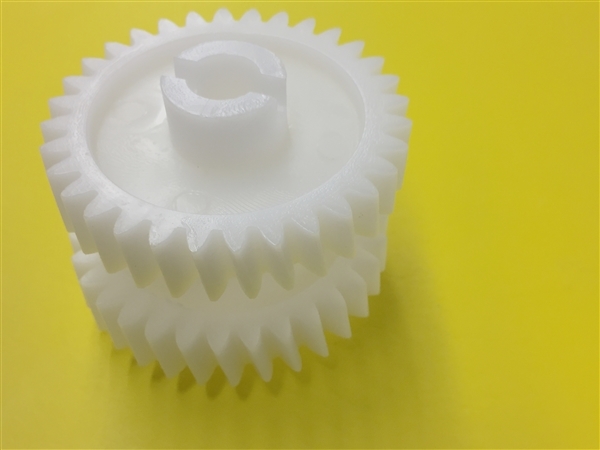 Technical: The Large Gear has 32 teeth and is 2 3/4" x 1/2" wide, with a 1/2" bore (sizes are approximate). You MUST apply a low temperature lithium grease (NOT included) to each tooth of the new gear or it will shred within days. Works with ALL 1/3 HP, 1/2 HP and 3/4 HP chain and belt drive garage door openers manufactured from 1984 to the present for these manufacturers: LiftMaster, Sears Craftsman, Chamberlain, Garage Master, Master Mechanic and Wayne Dalton. REPLACEMENT GEARS FOR LIFTMASTER CRAFTSMAN CHAMBERLAIN GARAGE DOOR OPENER MODELS MANUFACTURED PRIOR TO 1984 ARE NO LONGER AVAILABLE. Fits these Chamberlain Models: 1100, 1200, 2100, 2200, 4100, 4200, 4893OD, 5100, 6200, 710WHC, 711WHC, 7200, 7220, 7320, 7420, 7520D, 8100, 8100M, 8200, 9200, CG40, CG40D, CG42D, CSO, HD200D, HD600, PD100, PD200, PD210, PD210D, PD212, PD212D, PD600, PD610, PD610D, PD612K, PD612KLD, PD752, PD752D, PD758D, PD758S, WD822K, WD822KD, WD822KS, WD912K, WD912KS, WD922K. Raynor Navigator 2245RGD, Ultra 2595RGD, Endeavor 2585RGD, Aviator 2280RGD, Pilot 2265RGD. Also used for Wayne Dalton opener models 100 to 320. Fits these LiftMaster Models: 985, 1240, 1240R, 1245, 1245R, 1245LK, 1246, 1246R, 1250, 1255, 1255R, 1256, 1256R, 1260, 1260LK, 1265, 1270, 1280, 1280R, 1345, 1346, 1356, 215WD, 220WD, 2245, 2255, 2265, 2565, 2280, 2575, 2580, 2585, 2595, 315WD, 320WD, 3245, 3255, 3265, 3280, 3575, 3585, 3595, ATS211, ATS211R, ATS211X and ATS2113X. Fits these Sears Craftsman models: 139.53990, 139.53992, 139.53914, 139.53985, 139.53930, 139.5365, 139.53964, 139.53646, 139.53660, 139.53920, 139.53939, 139.184050, 139.18803, 139.18805, 139.18814, 139.18830, 139.53603, 139.53629SRT, 139.53629SRT1, 139.53674SRT2, 139.18850 and 139.18851. Only the most common models are listed here are listed here. If you don't see your Sears Craftsman garage door opener model listed here, please click here for our Sears Craftsman Garage Door Opener Gear Compatibility Chart. Includes: 2 Replacement heavy duty main drive gear ONLY (grease/lubricant is NOT included) - you can add grease from the options drop down menu above. Miscellaneous: If you need or wish to also replace the sprocket and shaft, please see part number 41C4220A. If you wish to also purchase the lubricant that you will need for this gear, please see part number 41A2817-CR. Tools: If you are looking for the tool to easily remove the spring pin holding the gear in place be sure to check the option above to add the 5/32" roll pin tool. It is the best tool to easily remove the pin without damage. It also reduces the chance for injury when driving out the gear with improper tools.